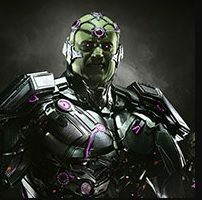 This page contains a character guide for Brainiac in Injustice 2 with movelists, combos, strategy guides and recommended gear for the villain character. Brainiac is a super-intelligent alien being from the planet Colu who has fought Superman many times. Extremely advanced mental abilities that have allowed him to work through numerous robotic and even human proxies make him a dangerously formidable opponent. It is difficult to tell whether you’re dealing with the original Brainiac, or one of his drones. His obsession with knowledge has led him to shrink down many cities to bottle size for transportation on his Skull ship, including Kandor of Krypton. Brainiac commands a Beta to fly towards the opponent. Brainiac commands a Beta to drop an Ion Bomb on the opponent. Below are combo and juggle inputs for Brainiac , including corner strategies and restarts.